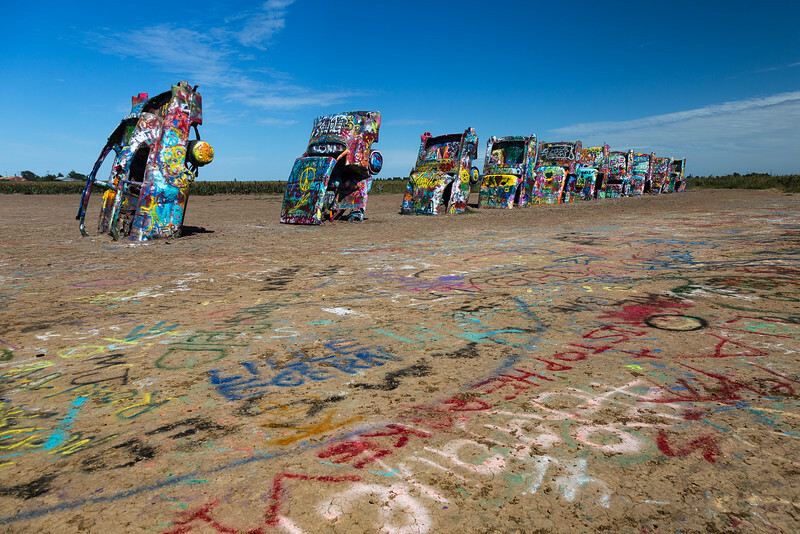 On our trip to Colorado, Alex Santiago and I were killing time driving through north Texas when we were reminded about the Cadillac Ranch, in Amarillo. We were just entering the outskirts of Amarillo and quickly had the new destination on our phone GPS. I had seen the Cadillac Ranch in movies and videos before, so it was somewhat surreal to actually be there. What I wasn’t prepared for were how the cars are now painted with graffiti and visitors are encouraged to keep the artwork fresh by adding their contribution. Cadillac Ranch is is a public art installation and sculpture in Amarillo, Texas, USA. It was created in 1974 by Chip Lord, Hudson Marquez and Doug Michels, who were a part of the art group Ant Farm. It consists of what were (when originally installed during 1974) either older running used or junk Cadillac automobiles, representing a number of evolutions of the car line (most notably the birth and death of the defining feature of mid twentieth century Cadillacs: the tailfins) from 1949 to 1963, half-buried nose-first in the ground… Cadillac Ranch was originally located in a wheat field, but in 1997, the installation was quietly moved by a local contractor to a location two miles (three kilometers) to the west, to a cow pasture along Interstate 40, in order to place it farther from the limits of the growing city. Posted in Auto, Texas, Travel Misc.